Diamond Factory Service is the place for appliance service, appliance sales and parts sales. Our appliance service area includes Southwest Michigan, Northwest Indiana The greater Chicago area and suburbs, Wisconsin, Saint Louis, and Kansas. We are proud to service many appliance brands including: Whirlpool, Kitchenaid, Jenn-Air, Maytag, Frigidaire, and Electrolux. We are a full-line repair company and service all major appliances from microwaves and ranges to refrigerators/freezers as well as all of your laundry equipment. 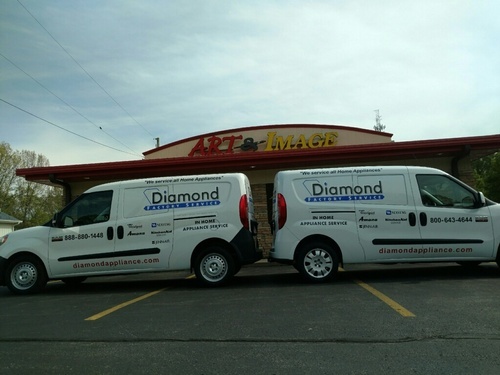 Diamond Factory Service has quality, trained technicians able to diagnose and repair all of your appliances. Our service guarantee: We guarantee our labor and parts for 90 days from date service was completed. If you are looking to save hundreds of dollars on appliances, including stainless steel models, you need to check out our Showroom! Conveniently located just north of exit 28 right off I-94 at 2611 M-139 S in Benton Harbor, Michigan, we offer a full array of major appliances, many with the full factory warranty. These appliances are overstocks, last season's models, or have minor scratches or small dents, etc. Stop by and see us, you'll be glad you did (and so will your pocketbook!). Diamond Factory Service is proud to have one of the most extensive parts departments in the Midwest. Although we stock the most commonly-used parts for repairs on every service truck, we also maintain an extensive inventory of parts in our parts warehouse. On-site are inventory parts for Whirlpool, KitchenAid, Jenn-Air, Maytag, and many others!